A Status Orange snow-ice warning has been extended until 12 midday tomorrow for Leinster, Cavan, Monaghan, Cork, Tipperary and Waterford. Met Éireann has warned that widespread lying snow and ice will continue to lead to hazardous conditions. The forecaster has also said there will be a risk of localised flooding due to rising river levels and there will be areas of surface water pooling, adding that mountainous catchments and urban areas will be most affected. Although a thaw is underway, conditions remain treacherous in many places and there are warnings of potential flooding as heavy snow melts. The Chairman of the National Emergency Co-Ordination Group, Sean Hogan, has said there are still very challenging conditions and while they are co-ordinating efforts to get the country back to normal, tomorrow "will not be a normal Monday for many areas". Speaking at a briefing this afternoon Mr Hogan said schools will make decisions tomorrow on a "case by case basis" but said it is unlikely, in the areas worst affected like west Wicklow, north Kildare and Wexford, that it will be possible for schools to re-open tomorrow. Mr Hogan said the normal Monday commute will also be very different and where possible they are asking people to use public transport. Employees and employers are being asked to stagger start and opening times for work to reduce peak volumes of commuter traffic and also to look at options of working from home. Gardaí have said there has been some flooding in Cork at Morrison’s Island, Father Matthew Quay, South Terrace, Lapp’s Quay and Wandesford Quay. At high tide just after 7am this morning, tidal water spilled onto the quays in these areas. It did not cause any damage, but gardaí have said driving through these areas is not advised and extra care is needed. Irish Water is appealing to all customers to conserve water usage. 10,500 people without water, mainly in Cork, Laois and Wexford with a smaller number affected in Kerry and Tipperary. 121,000 customers have had their water restrictioned in Galway, Kerry, Leitrim, Longford and Waterford. More than 3000 on boil water notices, with most of those in Aughrim Co Wicklow. Due to critically low levels in the Carnes and Balloy reservoirs, and a high demand, a water outage will impact 12,500 customers in East Meath from this afternoon. Duleek and surrounding areas of Cooperhill, Beymore, Carranstown, Platin Road, Bolies, Cushinstown, Kentstown, Riverstown, Rosnaree, Garbakllagh, Lougher, Rathdrinagh, Prioryland will all be affected by this outage. So too will Kentstown and the surrounding areas of Ballymagarvey and Danestown; Ardcath, Clonalvy and surrounding areas including Riverstown and Stamullen including surrounding areas of Balloy, Kilbreck. Customers supplied from the Louisburgh public water supply in Mayo are also being advised that there will be restrictions placed on the supply tonight from 11pm until 7am tomorrow morning. Irish Water said there is an unprecedented demand due to people leaving taps running during the freezing weather and this is causing reservoir levels to drop. CEO Jerry Grant said reservoirs in Belgard and Cookstown had also faced particularly strong demand, and so water supplies in parts of Dublin may have to be restricted. They supply Tallaght, Clondalkin, Rathcoole and the south of Dublin city centre. He stressed that priority would be given to ensure supplies to hospitals would not be be interrupted, if restrictions are introduced. Overnight water restrictions are in place in parts of Longford, Westmeath, and Galway. Conditions remain treacherous in many places and road users are advised to take only essential journeys. ESB Networks has said that power has been safely restored to almost all of the homes and businesses that lost power in Wexford during Storm Emma. A small number of homes are still without power but crews will restore supply as early as possible tomorrow. A majority of public transport services are expected to resume a full service today. Dublin Bus services are operating with disruptions to scheduled services, serving main roads due to poor road conditions on local roads. There are reduced frequencies and also diversions and curtailments. Intending passengers should allow extra time for their journeys. Bus Éireann has said that the majority of services are returning to normal, albeit some with delays and curtailments, and some subject to ongoing route assessment. 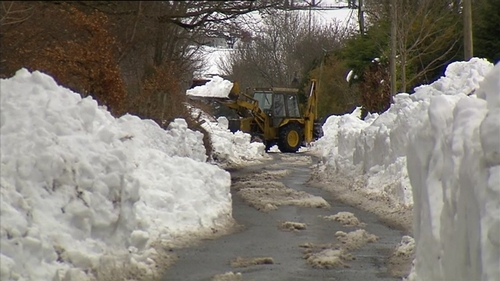 Many of these services operate in rural areas, and on minor routes - and in certain parts of the country, these roads remain in a very poor condition or are impassable. Given the ongoing Status Orange warning in some areas until noon tomorrow, there is likely to be disruption, particularly in parts of the east, south and south east. A full DART services has resumed, while Iarnród Éireann has said it is hoped all routes would return to normal with the exception of Connolly to Rosslare, M3 Parkway to Clonsilla, and Limerick to Ballybrophy via Nenagh. All three are suspended until Monday. The company also said that some Intercity services would operate with speed restrictions. The Luas Green line service is operating between Sandyford and Broombridge in both directions, with no service from Sandyford to Brides Glen, while the Red Line is serving between the Point to the Red Cow. Transdev, the Luas operator, has said that the Green Line will operate a full service from Brides Glen to Broombridge from Monday. The Red Line will also be running a full service, with a buses transporting passengers between the Belgard and Saggart stops. A tram and track inspection is to be carried out tomorrow morning. Dún Laoghaire Rathdown County Council in Dublin,has urged cyclists to leave their bicycles at home on Monday and to consider using public transport in the wake of Storm Emma. The Department of Education has also said most schools and third-level institutions will reopen on Monday. However, there are some closures already announced. In Wexford town, all second level schools are closed tomorrow, in Kildare, Salesian College in Celbridge and St Wolstan's in Celbridge will not open while in Wicklow Avondale Community College in Kilcoole is closed. Meanwhile Frances Fitzgerald, TD for Dublin Mid- West, tweeted about school closures in her constituency. The HSE has cancelled all non-urgent surgeries planned for Monday and has said there is no need for patients to contact their hospital. Hospitals will be in touch over the coming weeks to reschedule their appointments. Day surgery will proceed in most acute hospitals tomorrow. Non-urgent surgeries planned for Tuesday will be reviewed tomorrow and the HSE will make an announcement then regarding the remainder of the week. Outpatient appointments are expected to recommence across most hospitals tomorrow. However, at Wexford General, all outpatient clinics, radiology and cardiac diagnostics have been cancelled for tomorrow. The HSE says that due to the heavy snowfall and travel conditions, it has not been possible to discharge patients who were ready to leave hospital. This has led to a large number of patients being delayed in hospital. Outpatient clinics, elective and routine procedures will go ahead as planned at each of the three Dublin children's hospitals tomorrow. The Children’s Hospital Group said there may continue to be an impact on some services into early next week. Patients who had appointments cancelled last week will be contacted by the relevant hospital directly to reschedule their appointment. The HSE has said that home care provision has also been affected by the heavy snowfall. It is asking people to consider checking in on elderly or vulnerable members of the community and to make sure they have supplies of food, fuel, water and medicines, while it returns home care services to normal levels. Meanwhile, The Irish Nurses and Midwives Organisation has called for the first two weeks of March to be declared and treated as an emergency period in the health Service. It says it is extremely concerned about the pressures that will be brought to bear on the service, following on from the past five days of emergency weather conditions. The union says staff have worked for extended periods and will need rest periods, so rosters will have to be re-arranged to accommodate this and it will reduce available staff for services in the short term. The Irish Medical Organisation has urged the public to limit use of emergency departments and GP surgeries and to be patient as health services slowly return to full capacity.